I took this with my GoPro Hero 3+ and used the little remote to be able to conserve battery and switch between photo and video mode was really nice, but the GoPro did die a few hours into the flight so I only got footage up to arriving above the Treetopper’s site, Henson’s Gap launch. Update: I understand this is the first time this flight has been done by foot launching off the mountain! 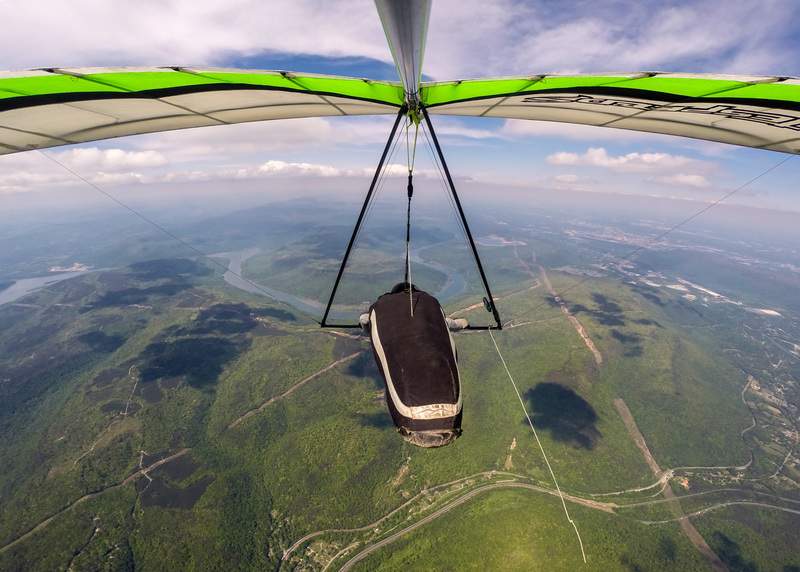 A flight from Lookout Mountain to Henson’s in the Sequatchie Valley is called the “milk run.” It’s not incredibly difficult, especially with good weather conditions, but it is also not a flight for the novice pilot. Six years ago a few pilots, including myself, realized that no one had ever done the milk run as an out and back flight! It had only been done as a one-way trip no one had ever tried to make it there and then come back too. Here’s my old blog post about one such failed attempt I made six years ago! That year a local pilot, Terry Presley, finally made the flight and XC magazine wrote a short piece on. Terry is an incredible pilot and nice guy, he is a commercial pilot with probably 10’s of thousands of hours flying all kinds of aircraft and he represented the US at the hang Gliding World Championships years back. Over the past six years no one’s repeated Terry’s record flight until this past Saturday . . . I did it!!!!! And if you notice from my blog post six years ago, I did it in the same old glider I’ve been flying for the past 7 or 8 years!!!! It’s hard to put into words what the flight meant to me. Since I first attempted this flight six years ago, I moved away from this area after getting a divorce. I switched careers and went back to school in Canada, then worked in California and Louisiana where I got and beat cancer. Now I’ve moved back to the Chattanooga area and after my first flight in six months, I achieved a goal that’s been on my mind for six long years. After all I’ve been through I felt so much gratitude to still be alive today to attempt it and make that flight. As any XC pilot knows, these kinds of flights are emotional roller coasters. Constantly managing risk and making decisions every few seconds. After over four hours of flying it can be incredibly exhausting, especially after not having flown in six months, or been on a flight this long in duration or distance in over 6 years. On the final glide when I knew I’d make it back, I was overwhelmed and had to blink away tears knowing I still had to land and needed clear vision for that! I couldn’t hold my head up and had to rest it on my base tube looking up sparingly to make sure I was going in the right direction. I had a decent landing but at the expense of severely cramping my arms and shoulders. My hands went numb, tingling either from the bone-chilling cold of being at around 7,000′ for the last 2.5 hours or from the severe cramps shooting down my arms. It was such a reward to do the flight on a day that so many people flew and landed at LMFP that I could share the accomplishment with the great community of pilots we have in this area and many friends I had yet to see since I’ve moved back. It was a flight I’ll never forget and probably the most difficult flight I’ve had. 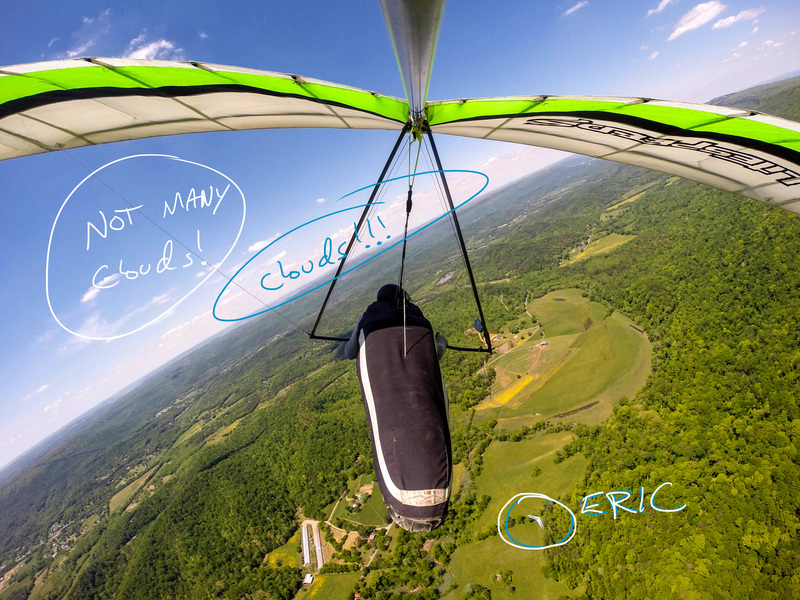 If you’re a hang gliding nerd like me, read more details below. First climb of the day. Eric came off after me and got in the same thermal. Notice all the clouds out in the Sequatchie Valley, but not much going on where we are. Below you can see how slow and difficult the day was for almost the first two hours. The big take away for me is about sticking it out and putting yourself in the right position for when the day gets good. Also, about recognizing when the day is good and you can be more aggressive and when the day is winding down and you need to slow down too and stop in climbs that are slower than you had been climbing in during the peak of the day. It took me the same amount of time to go 5.5 miles as it took me to go 28 miles! That was the difference between the valleys (starting in Lookout and going into the Sequatchie was better conditions) and the time of day. 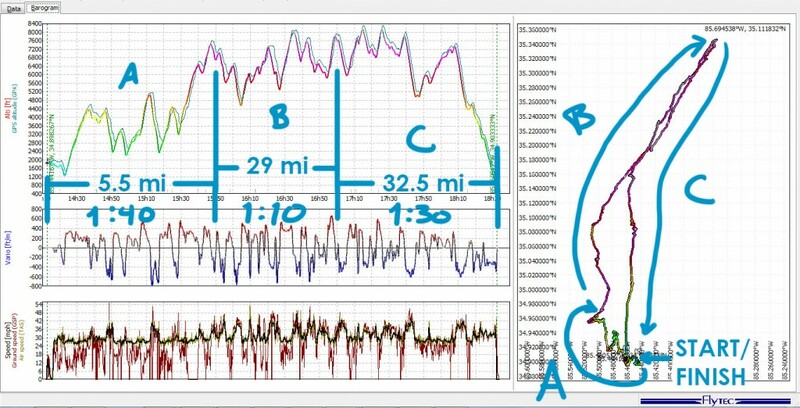 See the different periods of the flight above in the graph A, B, and C.
I was the first to launch at Lookout. I went off the bandit launch. It was around 2:30 and no one had launched yet all day for the most part. But I knew if I wanted a shot at doing this flight it was now or never because we’d soon be running out of daylight considering how long I expected this flight would take me. So without any indication of lift in front I just took a chance and launched knowing that time was ticking. I struggled in a bad thermal near the ridge and went out into the valley. I got down around 600′ above the ground and found a thermal! Once I made a couple turns in it, then Eric launched and joined me and we began climbing together. We went out toward the drive-in theater and got hit by a lot of sink. Eric turned back and I stayed around and caught another thermal and kept working for a long time. I knew the clearcut area on top of Sand Mountain must have some thermal activity so I kept being patient and working anything I could find until I could make my way on top of Sand. I put Marion County airport on my vario and when I knew I could glide toward that in an emergency, then I switched over the waypoint to my goal of Henson’s. I passed about 8 pilots who were coming from Henson’s to Lookout. 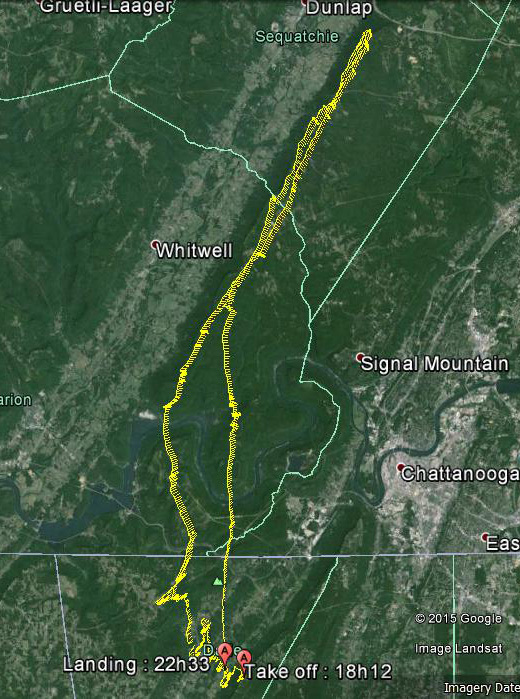 Then over the TN River Gorge I hit the cloud street and was getting up into cloudbase around 8,300′. My hands were freezing and I was constantly trying to warm them. I high-tailed it to Henson’s and turned around as quick as I could and started back to Lookout, always keeping an eye on my time, and two rounds of high clouds that came and went that could potentially shut me down like 6 years ago, but they burned off. I took a more direct line through the TN River Gorge. It was risky and something I haven’t done because of the limited landing areas. I had a decent amount of altitude but the Lookout LZ was still a 12.9 glide away according to my vario. I told myself I would find a climb and no matter how slow it was, stay in it until the glide I needed to get into the LZ was in the 8’s because I knew as soon as I left a thermal I was going to hit a lot of sink like I had been throughout the day. Plus there were no more clouds ahead. Throughout the day I was averaging around 5oo fpm or so climbs in thermals and now towards the end of the day I had to settle for about 200 fpm. I knew it’d probably be my last climb so I switched gears into being as patient as possible instead of the charging attitude I had during the peak of the day under the cloud street. It paid off and my vario told me I had the LZ on glide at about a 8.9 glide. Still skeptical, I started my final glide, porpoising through any lift I could find. I had a couple hundred feet clearance from the foothill in front of the LZ and I had enough altitude to make one turn over the LZ before my approach. The last hour of my flight I had been breathing heavily. The majority of the flight I was nauseous, maybe from the altitude, my hands were pretty frozen, I’d been fighting a foot cramp, and I could no longer hold my head up. I definitely paid for not having flown in so long and then doing a 4h15m flight! The tracklog is 108 miles long with all the thermalling and depending on how you measure the flight in distance it was somewhere around 64-68 miles long. Lots more I could say about this flight. The highlight for me, besides that final glide knowing I made it and had time to enjoy that while still flying, was just the beauty of this area, especially the TN River Gorge area. Big thanks to Stevie for being willing to drive for me that day, couldn’t have done it without the confidence to know someone had my back! Thanks! Get a summary of my posts once a month!